#1. This week's number one is an international forward Omari Gudul (206-94, agency: Two Points, college: Angelo St., currently plays in Bulgaria). He led Levski Lukoil to a victory against the closely-ranked Academik Plovdiv (12-6) 109-97 in the Bulgarian NBL last Saturday. Gudul recorded a double-double by scoring 12 points and getting 10 rebounds. It was the game of the round between two top 4 ranked teams. Levski Lukoil Sofia (13-8) is placed third in the NBL. It was his team's third consecutive victory in a row. Gudul has relatively good stats this season: 14.0ppg, 9.5rpg, 2FGP: 63.2%(12-19) and FT: 66.7%. He is currently a member of the DR Congolese senior national team. #2. Second place goes to an international guard Emmanuel Mudiay (196-96, agency: 3Eye, currently plays in NBA). Mudiay could not help the New York Knicks (26-45) in their last game. Despite his good performance the New York Knicks (26-45) lost 110-118 on the road to the Philadelphia 76ers. Mudiay recorded 12 points and added 4 passes in 28 minutes. This year Mudiay has relatively solid stats: 9.8ppg, 2.6rpg, 4.5apg, 1.1spg, 2FGP: 42.0%, 3FGP: 19.4% and FT: 63.4% in 15 games he played so far. He is in the roster of the DR Congolese senior national team. #3. The DR Congolese player who performed third best last week abroad was an international guard Myck Kabongo (191-92, agency: Octagon Europe, college: Texas, currently plays in France). He contributed to a STB Le Havre's victory against the closely-ranked Nantes (8-10) 79-74 in the French ProB (second division) in Friday night's game. Kabongo scored 7 points and added 3 assists in 17 minutes. STB Le Havre (9-10) is placed seventh in the ProB. This year Kabongo's overall stats are: 7.0ppg, 3.0rpg, 2.0apg, 2FGP: 54.5%, 3FGP: 33.3% and FT: 58.3% in four games. He has a dual citizenship: DR Congolese and Canadian. Kabongo is also a member of the DR Congolese senior national team. #4. An experienced forward Djo Loo Yele (203-82, currently plays in Norway) helped Asker Aliens win their game against the closely-ranked Baerum Basket (14-13) 86-75 in the Norwegian BLNO last Wednesday. He recorded 16 points, 6 rebounds and 2 blocks. It was the game of the round between two top 4 ranked teams. Asker Aliens BC (24-3) is placed first in the BLNO. They ended the series of three consecutive loses. It's Loo Yele's sixth season with the team. Loo Yele has reliable stats this year: 13.7ppg, 7.4rpg, 2.0apg and 1.4spg. He is also DR Congolese national team player. #5. International center Gullit Mukendi (203-96, currently plays in Spain) was not able to help Rosalia in their game against Estudiantes Lugo Leyma Natura (12-13) in the Spanish EBA (fourth division). Despite his good performance in Saturday night's game He scored 12 points and grabbed 5 rebounds. Mukendi's stats this season are: 11.3ppg, 5.7rpg and 1.3apg. He plays currently for the DR Congolese national team. #6. Power forward Jonathan Malu (200-93, currently plays in Germany) was not able to secure a victory for Ehingen/Urspringschule (7-21) in their game against MLP Academics Heidelberg (18-10) in the German ProA (second division). Malu recorded 5 points and grabbed 6 rebounds. Ehingen/Urspringschule was edged 82-80 in Heidelberg by the much higher-ranked MLP Academics (#3). It was Ehingen/Urspringschule's fifth consecutive loss in a row. There are only two games left until the end of the Regular Season. So now every game will be critical. It's Malu's first season with the team. His total stats this year are: 7.7ppg, 6.5rpg and 1.1apg. Malu is an international player who is currently on the senior DR Congolese National Team roster. #7. International center Herve Kabasele (208-96, also represented by Two Points, currently plays in Spain) managed to help Cafes Candelas Breogan Lugo in a victory against the 15th-ranked Barca II (9-18) crushing them 105-64 in the Spanish LEB Gold (second division) on Friday night. He scored only 2 points in 2 minutes on the court. Cafes Candelas Breogan Lugo (22-5) is placed first in the LEB Gold. This year Kabasele averages just 0.7ppg in nine games. He is also DR Congolese national team player. #1. Christian Eyenga (201-SF-89, currently plays in Spain) led Baloncesto Fuenlabrada to a victory against the closely-ranked Unicaja Malaga (14-9) 86-82 in the Spanish Liga Endesa in Sunday night's game. He scored 14 points, grabbed 7 rebounds and dished 4 assists in 32 minutes. Montakit Fuenlabrada (15-8) is placed fifth in the Liga Endesa. It was his team's third consecutive victory in a row. Eyenga has relatively good stats this year: 12.1ppg, 4.6rpg and 1.7apg in 23 games he played so far. #2. Charles Kahudi (199-SF-86, currently plays in France) could not help ASVEL Lyon-Villeurbanne Basket (11-12) in their last game on Saturday. Despite Kahudi's good performance ASVEL Lyon-Villeurbanne Basket was edged 92-89 on the road by the higher-ranked JDA Dijon (#10). He scored 12 points. This season Kahudi averages: 10.0ppg, 4.2rpg and 1.5apg. He has a dual citizenship: DR Congolese and French. #3. Viny Okouo (215-C-97, currently plays in Euroleague) was not able to help Unicaja Malaga in their game against Panathinaikos (15-11) in the Euroleague. Okouo scored only 4 points in 6 minutes on the court. Unicaja Malaga lost 79-90 in Athens to the higher-ranked (#6) Panathinaikos. It was Unicaja Malaga's third consecutive loss in a row. There are only four games left until the end of the Euroleague Regular Season. So now every game will be critical. This year Okouo's overall stats are: 2.0ppg and 1.6rpg in seven games. #4. Bismack Biyombo (206-C-92, currently plays in NBA) was not able to secure a victory for the Orlando Magic (21-49) in their game against the Boston Celtics (47-23) in the NBA. He did not beat the league record on Friday evening. Biyombo scored only 2 points, grabbed 7 rebounds, passed 3 assists and added 2 blocks. The Orlando Magic (21-49) was defeated 92-83 in Boston by the Celtics. This season Biyombo averages: 5.5ppg, 5.7rpg and 1.2bpg. #5. Kevin Tumba (205-C/F-91, currently plays in Spain) couldn't help UCAM Murcia (11-12) in their game against Andorra (14-9) in the Spanish Liga Endesa. Tumba cannot count Sunday's game as one of the best ones. He scored only 2 points and grabbed 4 rebounds in 11 minutes. UCAM Murcia was badly defeated 90-70 on the opponent's court by the higher-ranked (#6) Andorra. This year Tumba's total stats are: 3.6ppg and 5.6rpg in 23 games. He is another player who holds two passports: DR Congolese and Belgian. #6. Experienced Wen Boss Mukubu (198-F-83, college: UAB, currently plays in Belgium) couldn't help Limburg United in their game against Antwerp Giants in the Belgian Euromillions League. Mukubu scored 9 points. His team was defeated 85-81. This season Mukubu averages: 8.5ppg, 3.8rpg and 2.3apg. He has both DR Congolese and Belgian nationalities. #7. Ruphin Kayembe (200-F/C-92, currently plays in France) couldn't help ALM Evreux in their game against Sluc Nancy in the French ProB (second division). Kayembe scored 6 points and grabbed 5 rebounds in 17 minutes. His team lost 63-73. Kayembe's stats this year are: 10.3ppg, 5.7rpg and 1.5apg in 23 games. Similarly like Mukubu and Tumba above he also holds two passports: DR Congolese and Belgian. #8. Brice Massamba (208-F/C-88, college: UNLV, currently plays in Sweden) managed to help BC Lulea to win against the league outsider Nassjo 88-81 in the Swedish Basketligan on Monday night. Massamba scored only 4 points. This season Massamba averages: 3.0ppg and 1.5rpg. He has DR Congolese and Swedish nationalities. #9. 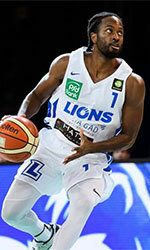 Yannick Bokolo (191-SG-85, currently plays in France) contributed to Pau-Lacq-Orthez's victory against the closely-ranked JL Bourg 93-82 in the French ProA in Saturday night's game. Bokolo scored only 4 points in 19 minutes. This year Bokolo's total stats are: 2.7ppg, 1.8rpg and 2.2apg in 23 games. He has dual citizenship: DR Congolese and French. #10. Bambale Osby (203-C-86, agency: Octagon Europe, college: Maryland, currently plays in Israel) contributed to an easy victory against the closely-ranked Elitzur Yavne 91-76 in the Israeli National League (second division) last Tuesday. He recorded a double-double by scoring 17 points and getting 14 rebounds. Osby also added 5 assists. Osby's stats this season are: 14.3ppg, 13.3rpg, 2.3apg and 2.3bpg. He is a naturalized American. Worth to mention Osby played also at Eurobasket Summer League, which helped him get the job in pro basketball. Strangely Osby has never played in DR Congo.